How much does it take to discourage you? 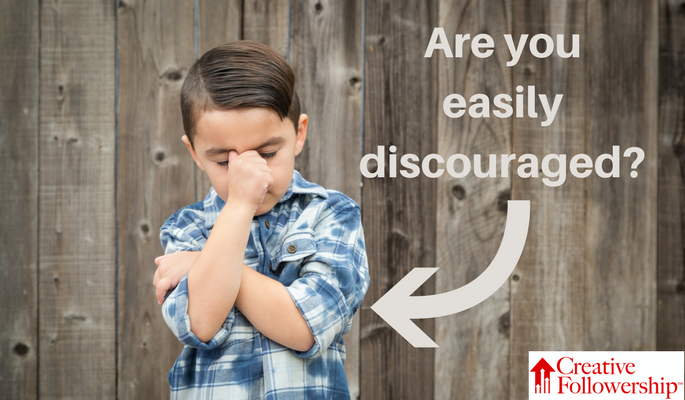 How do you deal with discouragement? As a youngster, I learned discouraging situations are something we all encounter; it is just part of life. I realized for some people discouragement is a terrible experience that demoralizes and leaves them depressed. Discouragement destroys their initiative and turns hope to despair. For other people, discouragement can spark their imagination and set their determination afire. No matter how hopeless the situation appears, they persevere in their determination to accomplish whatever they set out to do. They let nothing … absolutely nothing … demoralize them. I wanted to be one of those who conquered discouragement. It worked for me as a youngster and it still works for me as an old man. My first board meeting was a serious and enlightening experience. At the end of his report … the president announced his retirement. I am not easily discouraged. Long before that day, I learned the most satisfying experiences happen when we take on the most difficult tasks and successfully complete them. Fully aware of the difficulty, I was not discouraged. I was confident that I could help Atlanta Christian College. For over 30 years, one of my greatest pleasures was contributing time, energy and resources to the success of the college. Due to the resolute dedication of trustees, administration, faculty and supporters who were not easily discouraged, Point University (formerly known as Atlanta Christian College) will celebrate its 82th anniversary this year. It is a stable, successful university educating a growing enrollment of students for success in life and career in the twenty-first century. Don’t let discouragement rob you of life’s pleasures and success. Enthusiastically take on those difficult and dirty tasks. The pleasure of each success will encourage you to take on even greater challenges. Take control of your life and your career.